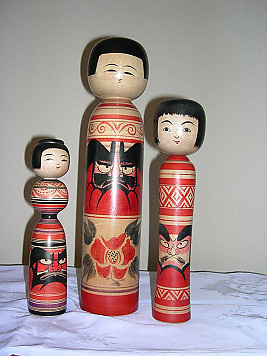 These lovely dolls are distinguished by the Daruma pattern painted on them with stripes and camellias. I asked one of the dollmakers why the scary daruma was painted on it and he said it was to keep evil spirits away from children. These dolls also have a “bust” and waist. These dolls tend to be more expensive as they are not so common.